The ipPerformance Group Guide to Best Practice is intended to describe the basics of intellectual asset management best practices. The following practices are supported by extensive experience, competencies, and documentation within IpPerformance Group. Our guide provides a catalogue of best practices that you may address either with IpPerformance or through their own benchmarking activities. The practice overview includes the step-by-step process, key stakeholders, and performance metrics. If you have any suggestions please submit them and we will evaluate the practice and update our guide. 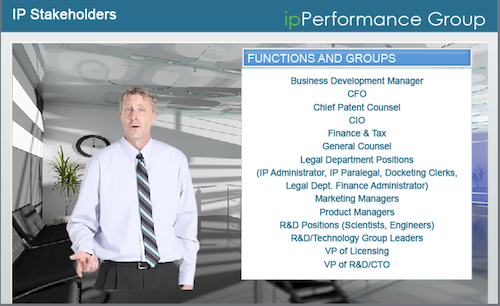 Manage the cost of patenting activity for your portfolio. The complete best practices with descriptive steps to complete, measures, value points, and functional participants are available in written, audio, and video formats. How do you do this? This provides a brief, complete description of the practice. Why should this be considered a best practice? What benefit is derived over other practices or methods? The points tested for each of the best practices include: quality gain, productivity gain, revenue impact, risk management, cost savings, and other. What type of measurement quantifies the usefulness of this practice? Who is involved in this type of practice? Please tell us your questions, thoughts, and suggestions.